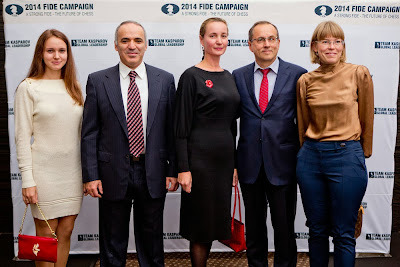 Former World Chess Champion Garry Kasparov of Russia held an event in Tallinn, Estonia, to announce his candidacy for the presidency of the International Chess Federation (FIDE) and to introduce the other members of his ticket. Here is the press release announcing Kasparov's team. Garry Kasparov today announced his candidacy for the presidency of the International Chess Federation, known by its French acronym FIDE. He plans to unseat 18-year incumbent Kirsan Ilyumzhinov, also of Russia, in the election that takes place in August 2014. Kasparov became the youngest world champion in the sport’s history in 1985 at the age of 22 and went on to hold the number one ranking for twenty years before his retirement from professional chess in 2005. Since that time Kasparov has become one of the most prominent opposition voices in Russia and he is the current chairman of the NY-based Human Rights Foundation. His Kasparov Chess Foundation promotes chess in education, a mission that is a centerpiece of Kasparov’s FIDE campaign. Kasparov then introduced the rest of his ticket, which represents every continent and a mix of business and investment expertise, organizational backgrounds, and chess experience. Jan Callewaert is a Belgian businessman and entrepreneur with extensive management experience. His passion for chess and its many educational benefits led him to join forces with Kasparov to co-found the Kasparov Chess Foundation Europe, of which he is president. 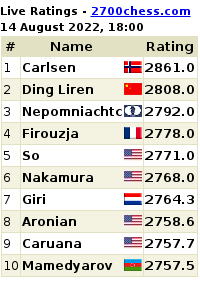 Ignatius Leong of Singapore is practically synonymous with chess in Asia. The current FIDE General Secretary, he is a renown international arbiter, organizer, and trainer with tremendous knowledge and relationships throughout the chess world. Sheikh Mohammed bin Ahmed Al Hamed of the United Arab Emirates moved from a long military education and career to becoming a prominent businessman in trade and transport, among other sectors. He owns several five-star hotels in Dubai and Abu Dhabi, including the Jumeirah Beach Hotel. He has a long-standing passion for chess as a player and patron. His educational foundation promotes chess in education in Abu Dhabi schools. Afrika Msimang of South Africa is the president of the Kasparov Chess Foundation Africa and has a remarkable career record of policy, social activism, and teaching. She has been involved in the successful Moves for Life program, a chess education organization that enjoys the patronage of South African president Jacob Zuma. Rex Sinquefield of the United States has turned his home city of Saint Louis into a global chess capital. An investor whose Dimension Fund Advisors oversees more than $300 billion, his Chess Club and Scholastic Center of Saint Louis has hosted the US Championship and other elite events while developing programs for scholastic chess. Each team member addressed the attendees, with Sheikh Mohammed and Sinquefield sending video greetings. Estonia then continued its warm embrace of Kasparov with Defense Minister Urmas Reinsalu coming to the stage to wish him luck and talking about the shared appreciation of the value of chess for kids, including his own. A full report with video and photos of the event is available at the campaign’s official website, kasparov2014.com. 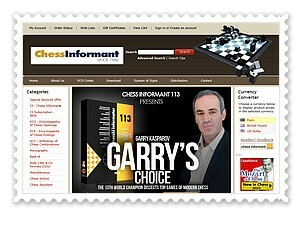 There you can also find more information about the Kasparov campaign’s team and ideas. More detailed policy papers will be published there as the team reaches out to collaborate with the national federations and the chess world. Expect more frequent updates on Kasparov’s personal Twitter and Facebook.